After the educational activities, staff and children then enjoyed a site tour of the recycle centre alongside the Education Officer. The trip concluded with an activity to test the children’s understanding of what they had learnt during the afternoon, by being asked to take part in a card sorting activity to place items into the correct bins/ facility for recycling or disposal. A great trip was had by all that attended and our home schooled children are now much more aware about the importance of recycling and the disposing of waste correctly. 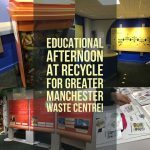 We would like to thank Recycle for Greater Manchester and the fantastic Education Officer that provided us with a fun and educational afternoon.